Colombia was the first country I visited in South America. And yet I didn’t write much about Colombian food while I was there. I had been struggling with travel burnout and while Colombia was one of my favourite countries I didn’t write as much as I should have. To be completely honest, some of the countries I love the most don’t have the world’s best food and when I first landed in Colombia I was afraid it was one of them. Colombia is one of my biggest recommendations in South America because Colombians are amazing people. Seriously they are so friendly it’s scary. After five minutes of meeting someone I would get invited back to a family birthday party. As a solo traveler I was taken aback by this in the beginning, and then I learned that’s the Colombian way. And so it hurts me to give this advice that I fear may offend my Colombian friends. The reason I wanted to write this post is because travellers need a primer into what to eat in Colombia. Otherwise they’ll get stuck eating a lot of fried snacks and not really understanding how diverse and delicious Colombian cuisine can be. I have such fond memories of the complex soups, fresh fruit juices and seafood. It’s a bit like Cuban food, tourists never really venture past 4 or 5 dishes and a lot of that is peso pizza. So they don’t appreciate how Cuban cooks make amazing dishes with such limited resources. Every culture has some delicious fried dishes. I even included a few foods in Colombia that are fried. But try to use this post as a bucket list so you get a better understanding of how much there is to offer. One of the biggest influences on Colombian food is the biodiversity of the country. Colombia is a huge country with a rainforest that most will never see, the coastal beauty of Cartagena and the amazing coffee region. 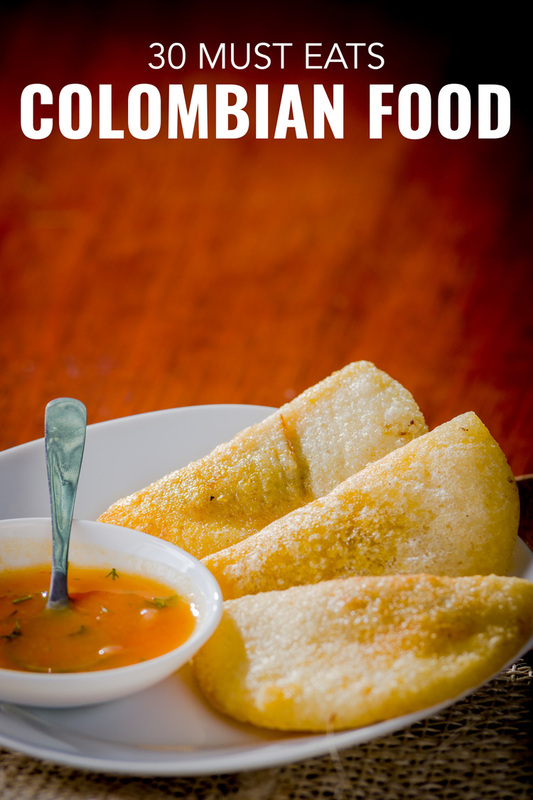 It’s incredibly diverse and so the traditional Colombian dishes can be quite diverse. The ingredients produced in the different regions can also have a big impact on the dishes available. From the seafood and agricultural produce of the coastal areas to the plants and cattle in the high Andes, these ingredients give you some fantastic dishes to try. In terms of the cultural influences that have an impact on cooking styles and preparation, Colombia also has a range of influences. Many dishes are cooked in a Spanish style, as the region was largely colonized by the Spanish. However, many dishes that are prepared with ingredients unique to this part of the continent also retain a strong indigenous influence in their cooking. Like many countries in Latin America, with the history of African slavery, you can find dishes that have an African influence. 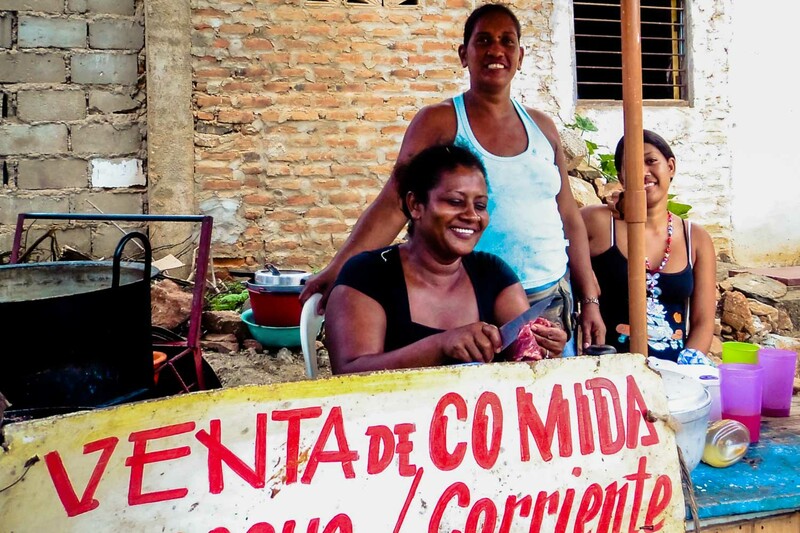 For this reason I can see so many similarities between Colombian food and traditional Cuban food, which was once the Atlantic hub for slavery from Africa. Originating in the north west and west, bandeja paisa has developed into something of a national dish of Colombia, and can be found across much of the country now. This is a platter dish that has a range of different Colombian foods. While in the Paisa region the meals are quite similar, there are plenty of alternative combinations as well. The meats in a traditional platter include chorizo, chicharron (pork rinds), black pudding and carne molida (grilled ground beef). These are accompanied by white rice, fried egg, arepas, avocado and red beans cooked with pork. Because of the size of the meal, it is often delivered on a larger than average plate in many restaurants. Regional varieties of the bandeja paisa can also include steak, pork and liver, while some areas will also include a side salad as well. You cannot leave Colombia without trying bandeja paisa. The flatlands of Los Llanos stretch across Colombia and into neighbouring Venezuela. It is in this grazing region that this barbecue dish originates. Ternera llanera is made by gently seasoning large cuts of veal before stretching the meat over large skewers. It is then barbecued or cooked over an open fire. The Colombian dish is often prepared for large family gatherings or events. Travelers can also find it at food stalls in festivals. Generally, the meat will be accompanied by potatoes, cassava and other root vegetables. Tamales are a ubiquitous dish found across Latin America. But this particular variety originates from the Tolima area of the country, and is distinctly Colombian. In most areas the dough is made purely from corn meal, but in Tolima they supplement this with white rice. Another important difference is that these tamales are generally served in a round shape, rather than the flattened patty of other tamales. The filling is made from pork and chicken, which has all been marinated in a mix of onion, garlic, peppers and cumin. The dough and the filling are combined then cooked in banana leaves. 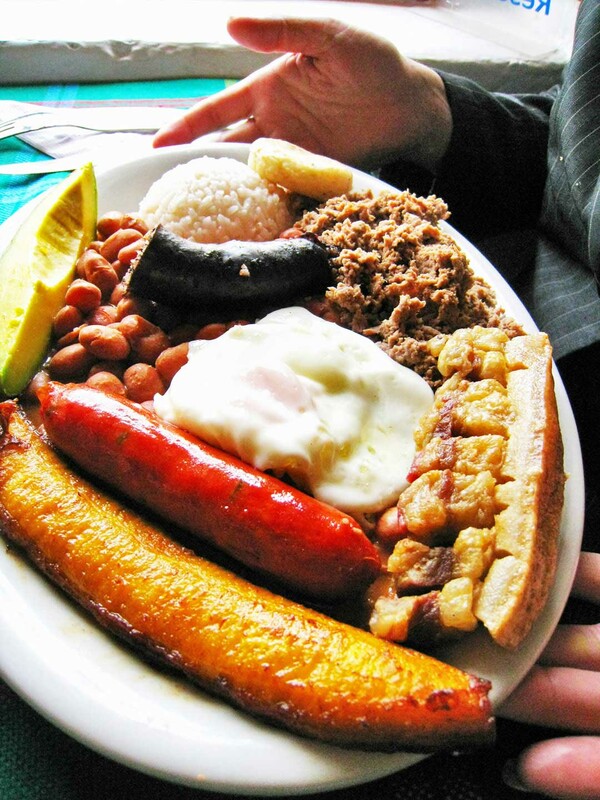 The fritanga is a Colombian meal that is made up of a variety of different meats that have been fried, and bears some similarities to the bandeja paisa. 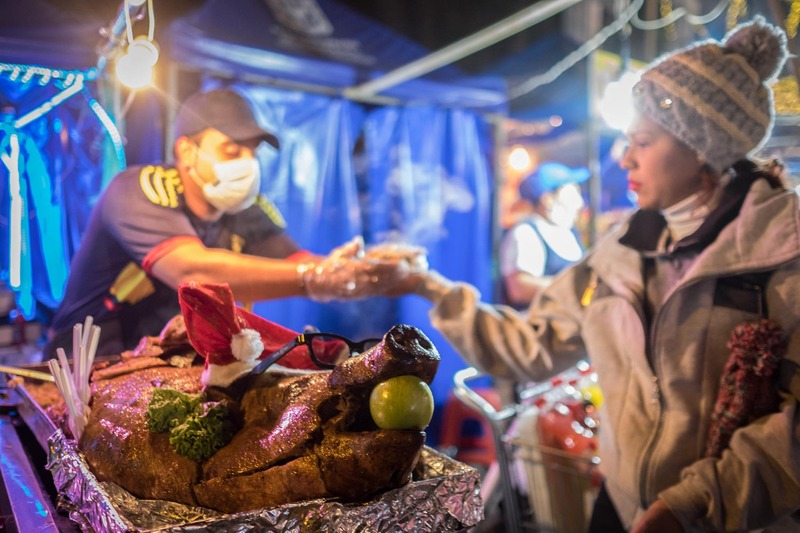 The variety of meat on offer will usually include chorizo, black pudding and the fried pork rinds known as chicharron, while chunchullo or fried intestines and also included. Fritanga is generally served alongside arepas, plantains and fried yellow potatoes. You can find it in restaurants and some street stalls. It is particularly common in Bogota and the surrounding area of central Colombia. If you could only eat just one soup in Colombia, this would be it. 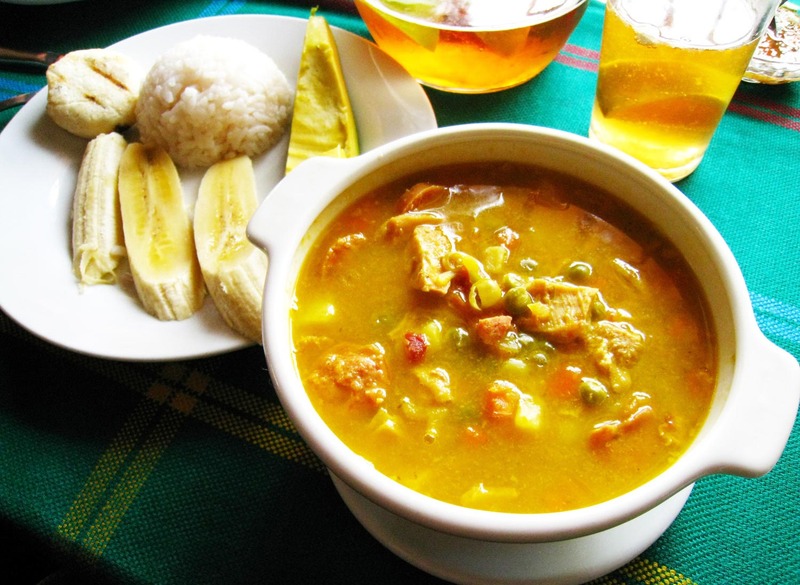 Although sancocho is found throughout Latin America it is incredibly popular in Colombia. The most common variety is made with pork, but it can also include chicken and beef. The meat is accompanied with diced vegetables including cassava and potato. The broth is thick and is close to being a stew, and is an especially hearty dish in the colder areas of the country. 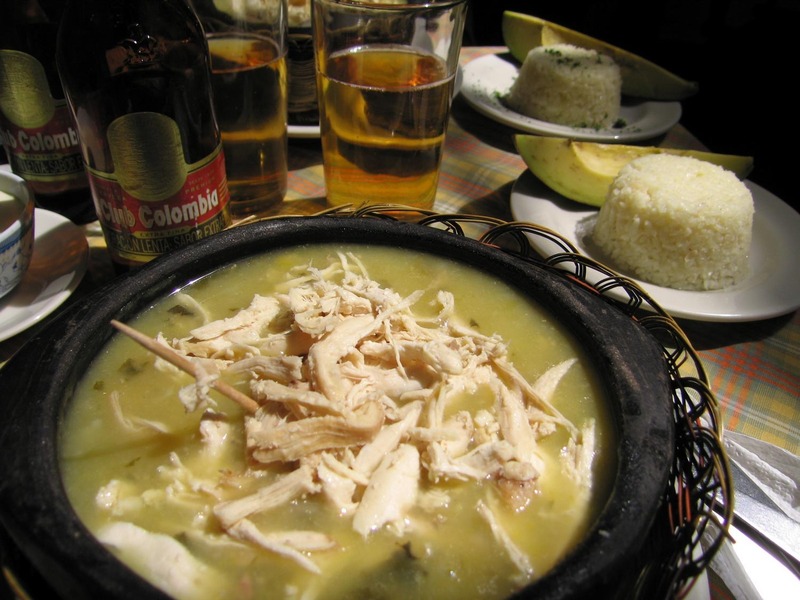 While many regions accompany the soup with bread, in Colombia it is generally served with avocado and white rice. Oh how I love a good guinea pig. It’s most commonly associated with Ecuador and Peru but you can also find it in the Andean highlands of Colombia. Roasted guinea pig is often served in celebrations or when visitors are present. They don’t look like the small pets we know at home, but are more like the size of rabbits. Guinea pigs have been domesticated in the Andes, and many family homes will have several that are kept around the home. The guinea pig itself is roasted until it is tender, while it can also be barbecued depending on the chef. I prefer it slow roasted as they can be a bit fatty. The roasted guinea pig is usually served with corn and potatoes, along with a salad made of peppers, boiled eggs and red chili. This Colombian food originates in the Tolima region of Colombia, where much of the pork in the country is produced. Another of the dishes that is often associated with celebrations and family gatherings, lechona is a whole roasted or barbecued pig. The traditional way to roast the pig is in an outdoor brick oven, but as these aren’t always available they can also be roasted in an oven or barbecued. The pork is generally served with a piece of the crispy skin, and a stuffing of spiced rice and peas. For a big event, you will often find a range of sides, salads and desserts accompanying the main meal. 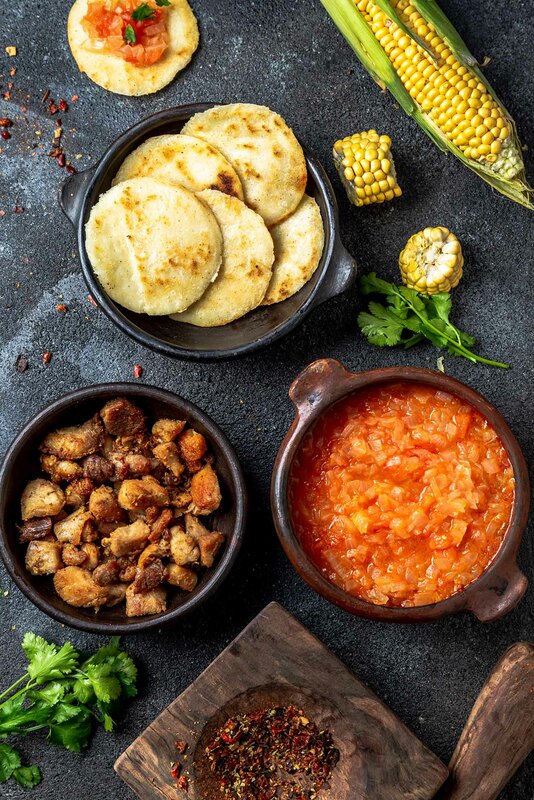 Another of the dishes that originated in the Andean region of the country, ajiaco makes good use of the ingredients that they have available here. 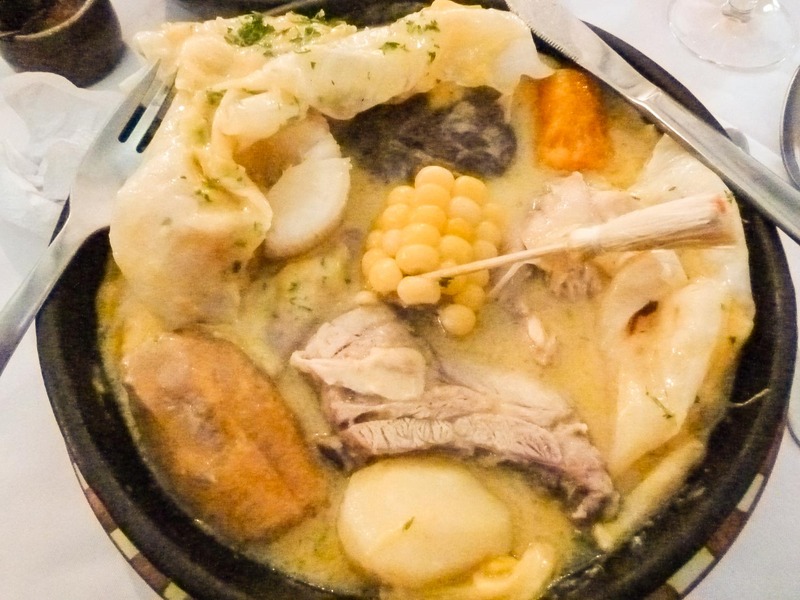 This is a hearty soup that is made using potatoes, which originated in these South American mountains, and chickens which are raised by most people in the region. The key flavour of the soup that differentiates it from other dishes is the use of guascas, also known as potato weed. This has an intense artichoke-like flavour, and if the soup doesn’t include guascas, then it isn’t ajiaco! One of the things I love about South America, is that they often have soup for breakfast. As someone who doesn’t care for pancakes or waffles I embrace this whole heartedly. The Andean region of Colombia is one that naturally has a much colder climate, and this soup dish is another of the region’s hearty meals. The main ingredient for this Colombian soup is beef ribs, and many people may find it surprising that it is generally eaten as a breakfast dish. The soup is prepared with the ribs being boiled in water until they are tender, along with slices or chunks of potato. The broth is then seasoned with garlic, onion and cilantro. 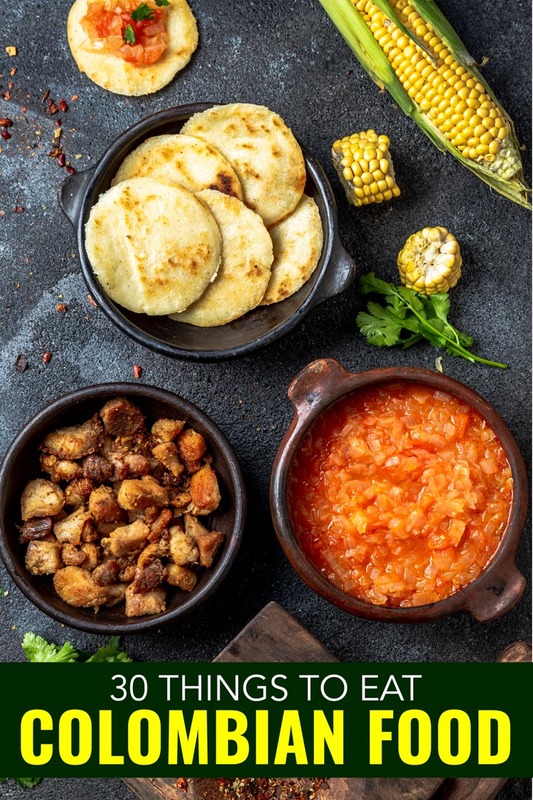 If you are looking for a strengthening breakfast in Bogota or the Andean region, caldo de costilla is often accompanied by arepas, bread and chocolate. Mondongo is a distinctive Colombian soup or stew that is found across the country, it’s also popular in Central America, such as in Honduras. This is a tripe stew that can be made with beef or pork tripe depending on the region, and this is generally marinated with lime and cilantro before being cooked. The broth should be well seasoned with onions and more cilantro. It often includes chopped vegetables and some varieties also add chorizo. Mondongo is often considered to be a hangover cure or a restorative in Colombia. Like many of the country’s hearty dishes, this soup originated in the Andes before being shared across the country. One of the great features of the coast of Colombia is that there is a huge variety of seafood available. This delicious seafood casserole-like stew is found in the coastal areas of Colombia. The Colombian food makes good use of the ingredients, generally including squid, shrimps, clams and chunks of white fish. The broth for the dish is flavoured through the cooking of the casserole, and is then blended with cream, white wine and coconut milk. The finished dish is then seasoned with thyme, garlic and onion, giving a creamy and mild seafood casserole. However, be careful with when you enjoy this dish, as it is said to be an aphrodisiac. Almost every culture has a fried side dish that appears either as an appetizer or as a side for a main meal. While Mexico has nacho chips, and the US has potato chips, for Colombia this dish is patacones. One of the crops that is raised in Colombia is the plantain, which is a starchy variety of green banana, which lacks the sweetness of yellow bananas. The plantain is thinly sliced and flattened, before being fried gently on both sides for a couple of minutes to give it a crispy finish. Patacones can be served with almost anything, and is often an appetizer with a range of dips including guacamole and hogao, which is a tomato and onion dip. They can also be found in street food dishes, with a popular option being to top the patacones with shredded beef. Frankly I think nacho and potato chips have nothing on patacones, I’m shocked they haven’t taken the world by storm because they are so delicious. 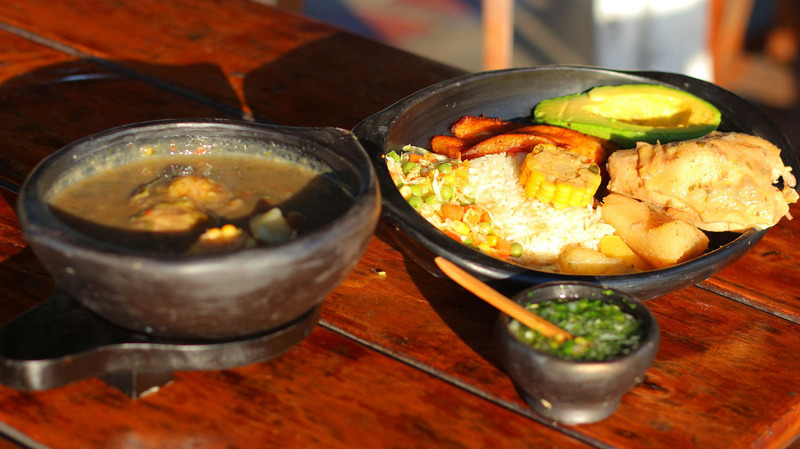 The Andes has produced a variety of inventive soup dishes to make the most of the ingredients that they have available in the region. Cuchuco is a grain and vegetable soup, and was traditionally a peasant soup as it was made by the remains of the corn, barley or wheat grain after it had been milled into flour. While you may occasionally find cuchuco made as a vegetarian soup, today it is more commonly made with pork. The broth is cooked with the pork, along with potato, pepper, onion and carrots. The soup is then seasoned with garlic, cilantro, and salt and pepper to taste. Found across the country, this chicken stew will often have regional varieties featuring seasonal vegetables. In homes this is often a pressure cooker dish that is cooked at a lower temperature throughout the day. The chicken is accompanied in the stew with cassava, which benefits by softening during the long cooking time. The stew is flavoured with cilantro, garlic and sazon, which is an intense seasoning made with achiote, coriander and cumin. Because this sauce is quite thick, the dish is commonly served with white rice to absorb the flavour from the sauce. This dish will often be found in Colombian homes on Christmas Eve, when families prepare a large dinner for the family late at night, after midnight mass has been celebrated. While many dishes have variations that can differ across a country, the breaded pork cutlet is one found across the world. Also known as pork milanese in some parts, this is Colombia’s variety of the dish. The cutlet is usually marinaded in lime juice, cumin and garlic then breaded for frying. The meal is usually completed with white rice, patacones and avocado. However, in some restaurants, you may also find the patacones replaced with french fries. Although this is particularly common in the west of the country, you will find chuleta valluna in most parts of Colombia now. Rice is a staple of Colombian cuisine, and while there are a huge range of rice dishes, this dish comes from the city of Cali in the west. I visited Cali for six weeks as it is the world capital of salsa. I’d like to say Im now a salsa dancer, but sadly no. Cali is also the hometown of drug baron Pablo Escobar, and while Colombia gets a bad rap for cocaine, after three months I didn’t see any drugs. In fact, I’ve heard Peru now produces more cocaine and I’d believe that as it was prevalent in hostels. Arroz atollado is rice supplemented by chicken, sliced sausage and bacon which have all been fried before being added to the dish. There are also plenty of vegetables that are included as well. This often includes red and yellow peppers, peas, carrots, onion and tomato. As all the ingredients are finished off together in the saucepan, the juices of the meat and vegetables all seep into the rice to give a savory flavour. Arroz atollado is usually served with patacones and salad. This stew is one that takes many of its influences from Spanish cooking. 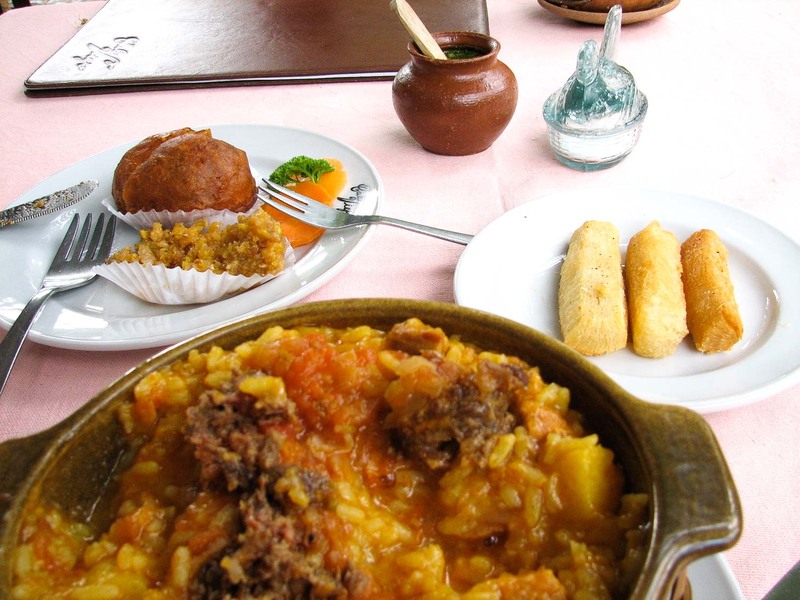 Puchero Santafereño is another hearty meal that is most commonly found in the Andean highlands, and especially in Bogota. Are Museums in Bogota Worth Visiting? As with many meals there is no shortage of meat in the stew, which can included diced beef, chicken and pork along with chorizo. This is then supplemented with cassava, plantains, potato, cabbage and corn. Interestingly, this meal is prepared in one pot, but is then divided into the broth which is served first, before the main course of stewed meat and vegetables. The meat and vegetables are usually served with white rice, avocado and hogao sauce. 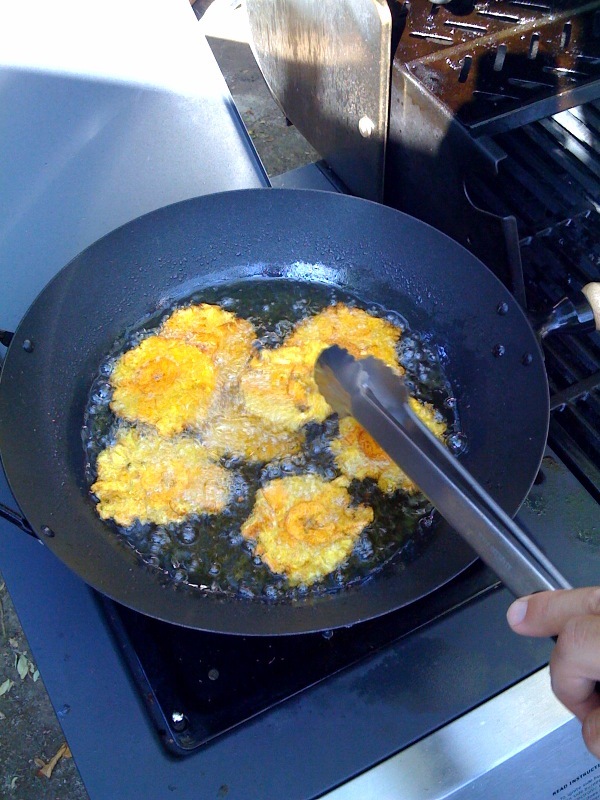 These fritters originate from the Caribbean coast of Colombia, and make good use of the commonly cultivated cassava. Also known as yuca in many areas, the first step in preparation of these fritters is that the vegetables are peeled and boiled, before being mashed to make up the dough. They can then be stuffed with the filling before being fried. 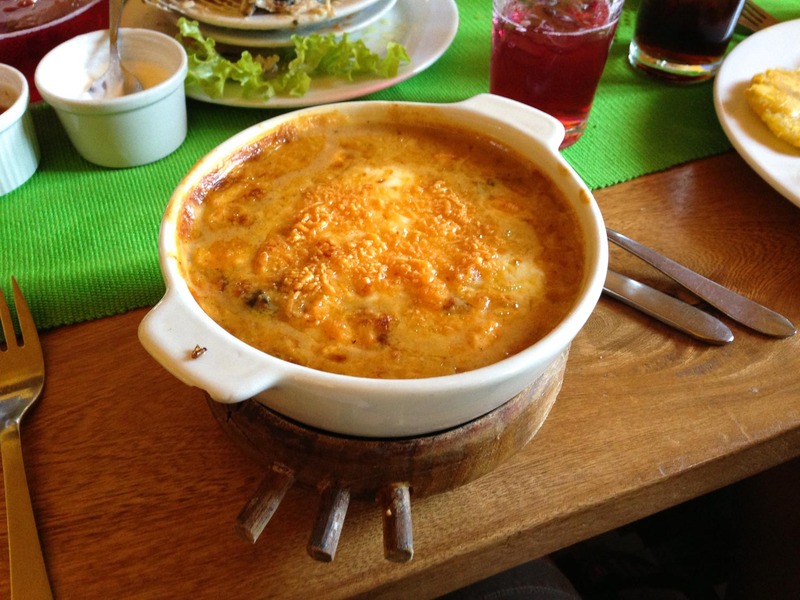 On the Caribbean coast, this is a breakfast dish and is filled with local cheese. However, there are varieties now found throughout the country, and in Bogota this is often filled with beef, boiled egg and rice. Each country will have its own delicacies that can sound a little unusual to visitors, and in the north east of Colombia, this is certainly the hormigas culona. These are essentially leaf-cutter ants, from which the females are harvested as they have the meatier body. Sure it may not be the most popular Colombian food. But hey, they say eventually we’ll all be eating insects as they are the most sustainable protein. I love chapulines in Mexico with garlic and chilli flakes – yum! These ants are usually fried or roasted and then salted, before being served as a side dish to a main meal, or occasionally eaten as a snack. Despite not being a naturally appetizing option, these are quite tasty, low in fat and are also a great source of protein! Originating from the Valle del Cauca region of Colombia on the west coast, this cheese bread is now found in many areas of Colombia. There are a variety of different recipes available, but the one essential is that this is prepared with cassava flour. This is very similar to pao de queijo in Brazil. It is combined with local cheese to make a light dough for the bread. In some areas, the dough for the bread is supplemented with a guava jam for a different dash of flavour. The bread is usually eaten fresh with a cup of hot chocolate. Legend says that the name for the bread comes from an Italian baker who was living in Colombia, and had baked his first cheese bread. He would then roam the streets yelling ‘pane del buono’, which translates as ‘good bread’. While the truth may be lost to the mists of time, the bread certainly isn’t! 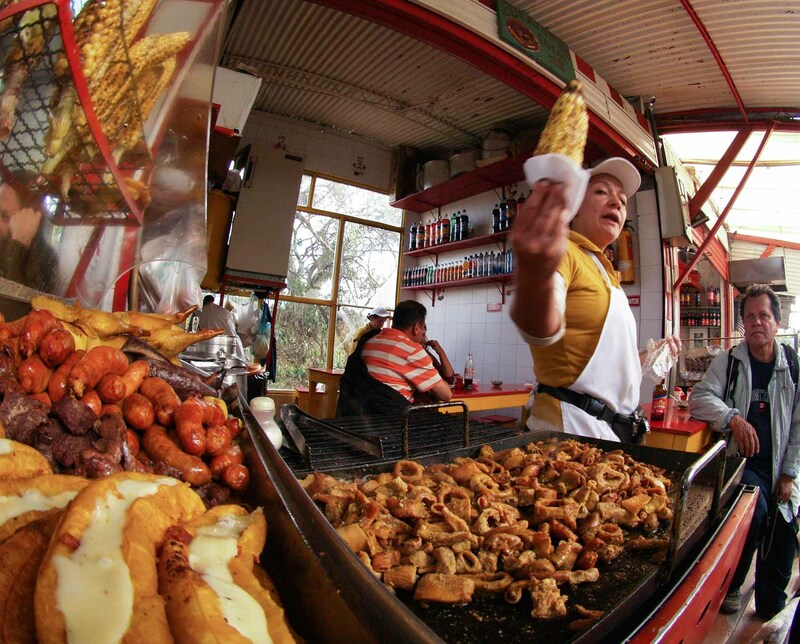 This meal is particularly popular in Bogota, but is often found across the country, wherever corn is cultivated. The base of the dish is cooked corn stacked with shredded chicken, beef, bacon or vegetables. On top of this is then piled plenty of grated cheese or crumbled white cheese. This mixture is smothered in garlic sauce or another creamy topping. It is addictively good. Brought over by the Spanish, there are different versions of Bunuelos from Cuba to Ecuador. 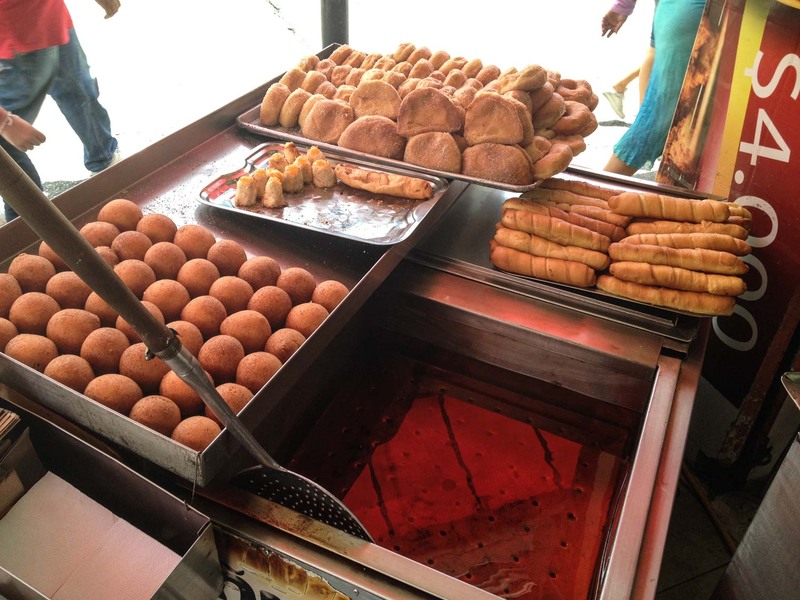 The stalls selling buñuelos in Colombia are very distinctive. They will usually have the largest pan of hot oil bubbling away. These small balls of dough are certainly a delicious and warming snack. They are a very simple snack. Often made with a small amount of white cheese combined with the wheat dough. Each small dough ball is then tossed into the oil for frying for just a short time until it is golden brown and ready to eat. It’s like the best donut you’ll ever have. Although often associated with Christmas, these small dough balls are available throughout the year. They are sometimes served with chocolate sauce or dulce de leche. When I arrived in South America I wondered, where are all the tortillas?? They were my favourite part of Mexico and Central America. I quickly realized that my beloved corn tortillas do not exist in South America. But I was introduced to arepas and I forgot about the tortillas. Probably the oldest and most important culinary food in pre-Columbian cuisine in Colombia is still one of its most common today. Arepas are believed to have been eaten here and in Venezuela for around 3,000 years. Maybe one of the most famous Colombian food, arepas are a simple blend of maize flour, water and salt. 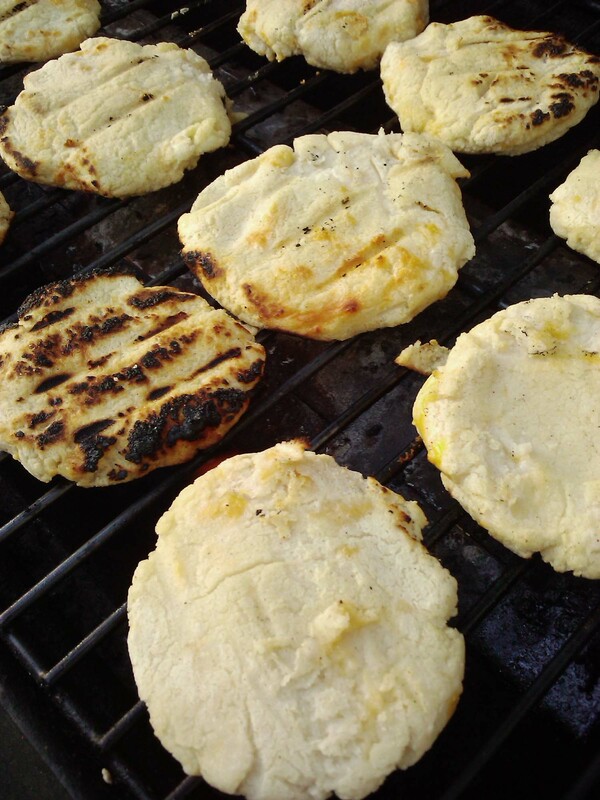 It is worked into a dough patty, the arepa can be fried, grilled or baked. Arepas are found in stalls and stands across the country, and at their simplest can be topped with a wedge of cheese. Depending on the region of Colombia, they can also be topped by tomatoes, ground meat, shrimp and fish. In the north-western Paisa region, there are also stuffed arepas available too. In many countries, if someone asks you if you want something para picar with your drink it often means a snack or something to nibble on. A picada usually means street meat. It may include beef, pork ribs and chorizo that have been fried and then put together in one platter. This will often be accompanied by fried potatoes and cassava, along with a dip of guacamole. There is often a side of patacones or French fries to complete a satisfying meal. I cannot count how many salchipapas I’ve eaten in my life in a very short period of time. 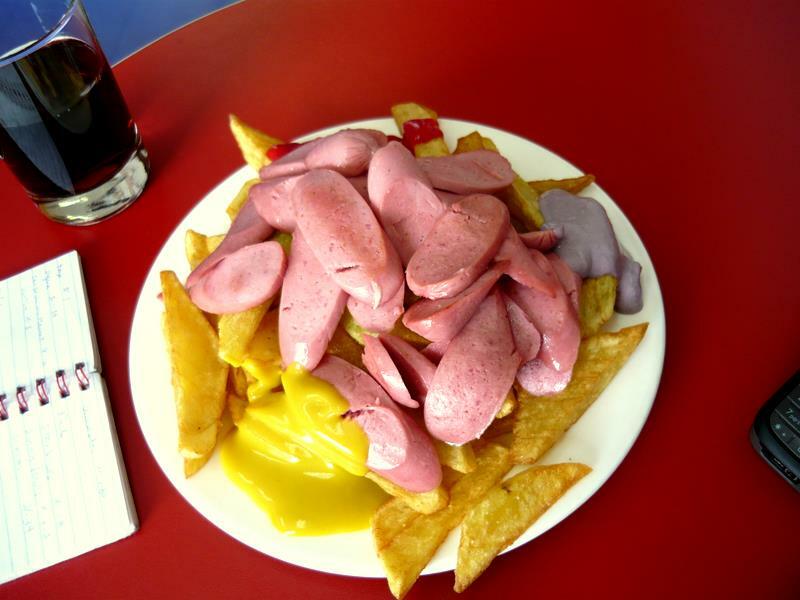 One of the typical night-time street foods that is often eaten after a few drinks, are salchipapas, which are at its most basic form, French fries topped with hot dogs. I’ve seen versions with fried potato wedges and sausages but more often its just sliced hot dog on fries. The combination is then smothered in mustard and ketchup, or a selection of other sauces. My personal favourite is just ketchup and mayonnaise. The combination of a meat filling wrapped in dough is one that is a winner as street food across the world. Empanadas are found in many parts of South America. 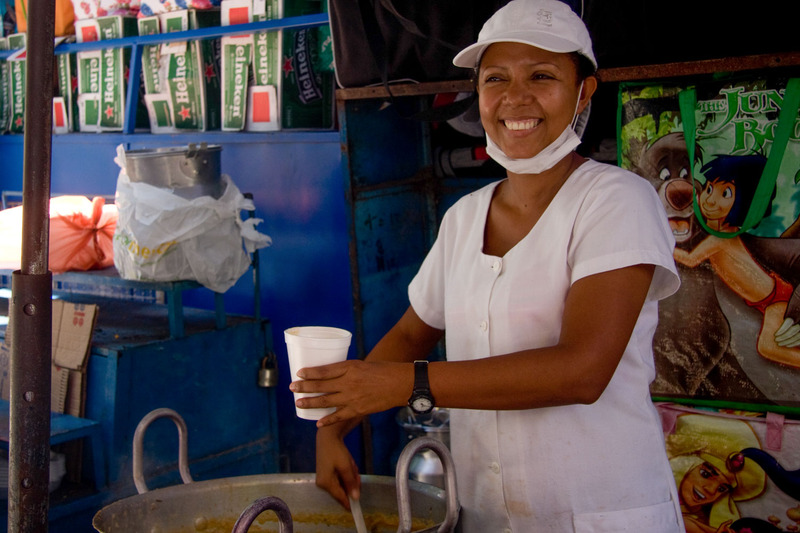 They are the easiest street food to find in Colombia. Colombian empanadas are only a few mouthfuls. But that is enough. It’s usually a corn based dough with a meat and potato filling. You will also find that there are chicken or vegetarian varieties available in many stalls as well. The dough pocket is then deep fried just before eating. It is often served with a hot picante sauce. When it comes to the most popular desserts across South America, there are few that can rival torta de tres leches (photo above). Literally translated, this means ‘three milk cake’. The ‘three milks’ are in the thick sauce that soaks the cake. It is a blend of sweetened condensed milk, heavy cream and evaporated milk. This is usually smothered over a light sponge cake batter prior to the cooking of the cake. 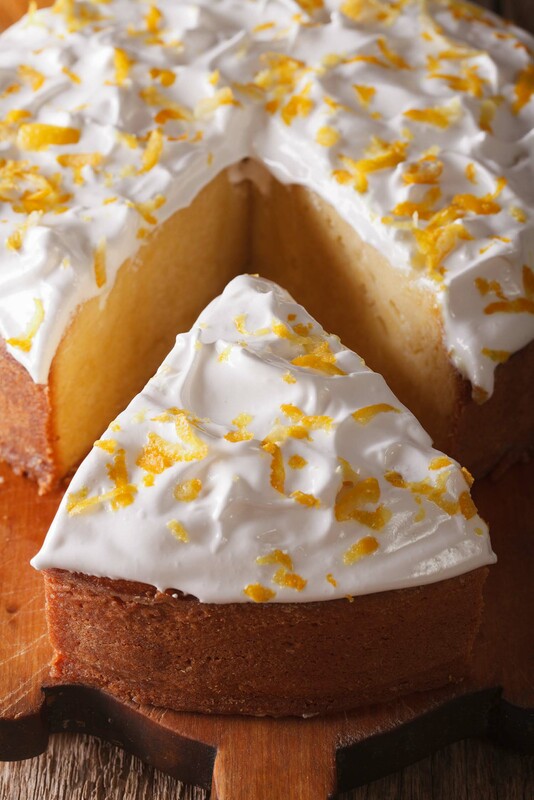 When served the cake is often covered in a light white frosting. It may also be topped with glace cherries or strawberries. This creamy dessert may not appear to be much when you first see it. However, it is certainly worth trying and is a staple Colombian dessert. Postre de natas was originally prepared in the Andean region, but it is now found throughout the country. Essentially, this is made by taking the cream or froth from the top of a pan of whole milk that is repeatedly brought to a boil. This cream is then mixed with syrup and a little rum. It’s divided into individual glasses and chilled in the refrigerator. For presentation, the dessert is often sprinkled with raisins. The result has a creamy and slightly gloopy texture, but a lovely sweet flavour. As simple as this dessert is, it is also one of the most popular in Colombia. Braveas con arequipe combines two delicious ingredients of figs and arequipe. Arequipe is also called dulce de leche in many parts of the country, Argentina and across South America. It is a thick sweet paste made with milk and sugar. The preparation of this dessert is very straightforward. The figs in syrup are simply cut across, and two or three teaspoons of arequipe is added into the cut fruit. These can then be stored for several days or eaten immediately. These figs are then served with a fresh white cheese to balance the sweetness. This little pastry delight is one that is often prepared at home. But is also available from the majority of bakeries across the country. The puff pastry is thinly sliced, and then divided by thin layers of cream and dulce de leche to offer a lovely blend of textures and flavour. Over the top layer of pastry, some bakers will add an additional thin layer of cream or dulce de leche. Others will simply dust the cake with icing sugar. There are also some who will add a frosting on the top. Bakers will draw a beautiful pattern with chocolate sauce for a particularly impressive finish. What Colombian foods did I miss that should be added to this list? Let me know and I’ll add it to the bucket list above! Wow! looks yum, Have never tried the traditional Colombian food though, would really like to try it. I shouldn’t have clicked on this article while at work, I’m getting really hungry now. This food looks so delicious. This has made me hungry again. Best of luck.